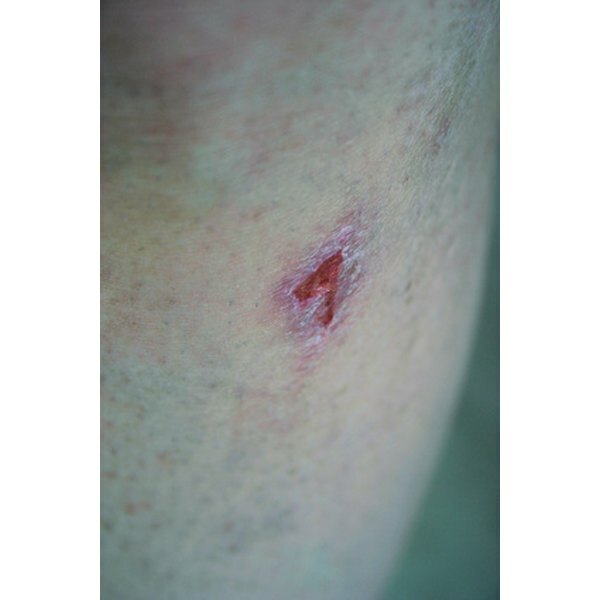 Wounds may be cleaned with a variety of solutions that vary in their effectiveness. Drinking water is safe to use and may be as effective as sterile water or saline if the latter two are unavailable to the first responder in the field. In the hospital setting, sterile 0.9 percent saline is the solution of choice unless normal saline is contraindicated. Other solutions are preferable for use on wounds where infection is present. Potable tap water is safe to use to clean a wound if the means for the sterilization of water is not available to the person administering on-site care. Water at body temperature is preferred because it minimizes the loss of wound temperature to the patient. If no clean water is present, and the patient will be evacuated and treated quickly at a health care facility, it is best to simply stem the bleeding and cover the wounded area. Sterile water is safe to use for the cleansing of wounds anywhere on the body. One liter of water brought to a rolling boil and allowed to boil continuously for at least 60 seconds may be considered sterile. The water should be cooled to body temperature before it is used to cleanse the wound. A solution of sterile water may be kept in a sealed container and refrigerated where possible. The solution will remain fresh and viable for several days. Sterile saline comes prepackaged for use by paramedics in the field and for health care practitioners in a hospital setting. Sterile saline may be replicated by boiling 2 cups of water for at least 60 seconds. Then add 1 tsp. of salt to the sterilized water. This solution may be used to clean wounds anywhere on the body and may be packaged and stored for later use. A solution of Betadine mixed with saline or sterile water is especially good for cleansing wounds that have become infected. Mix one part Betadine to at least three or four parts sterile water or saline, because Betadine alone can be toxic to healthy tissues. Betadine solution should be used to cleanse wounds until infection is no longer present. Another, gentler solution may then be used at dressing changes. It is safe to use Betadine solution on the face and around the eyes as needed. Dakin's solution is another antibacterial agent that is used in the presence of infection. Unlike Betadine, Dakin's is not safe to use around the eyes. Some pharmacies stock Dakin's Solution, but you can make it by mixing 1 or 2 tsp. of liquid bleach to 1 liter of sterile saline solution. The solution should then be further diluted before using for wound care: one part Dakin's to three or four parts saline or sterile water. Dakin's solution is also good for dressing changes. Nursing Times: Wound Cleansing- Sterile Water or Saline?